Pio's parents were shepherds in Southern Italy and it was into this life that he was born thirteen years prior to the end of the 19th century. As was his family's custom, he was intimately involved in the local church and served as an altar boy. His family was in attendance with regularity. When Pio looked back at his childhood many years later, he would recollect that he had made a decision to commit himself wholly to God at the young age of five. From then on, he recalled, he strained after intimacy with the God who called him into being and the priesthood. Pio's family helped guide and push him onward in his relationship with God and taught him to pray and memorize the scriptures. As Pio went to sleep at night, he was ushered there on the stories of the scripture told in the voices of those close to him. When Pio was ten, his family had the opportunity to listen to a Capuchin friar seeking monetary and prayer support for the monastery that was hoping better to live into God's calling upon the life of St. Francis. Pio was awestruck by the friar and subsequently became convinced that this was the particular calling that God had placed upon his life: the monastic life of prayer and mysticism. His family supported this calling and took him to the Capuchin monastery to inquire if he could join them. They had heard of the boy known for prescribing his own penance, have ecstatic visions, and dwelling upon the mysteries of the faith. They assured him that they would accept him if he would receive the education he had missed while tending his family's flocks. Pio's father moved to the United States of America to make enough money to pay for Pio's school and he was soon initiated and ordained into the order. Pio served as spiritual director of two separate monasteries and became known as a worker of miracles. These miracles--including healing and miraculous discerning--are what occasioned his discharge from the Italian military he was conscripted into (as a chaplain) for World War I. As a spiritual director, he was interested in a daily life of discipleship that involved recognition of one's place before God and acceptance of unmerited suffering as the fertile ground of spiritual growth. In this way, Pio claimed to appreciate the considerable suffering he underwent with his own illness and physical weakness. He advised those under his direction to be as regular with confession as you would be with dusting your house because, ultimately, they had the same effective purpose: removing tarnish and corruption from that which is valuable to you. Pio was quick to advise any who would listen that the practice of Christian teaching amounted to: "Pray, hope and don't worry." Controversy was not far from Pio's life, however. He experienced great physical pain and suffering because of his poor health but also, he felt, because he was under attack by demonic beings. His understanding of suffering and penance is clear: the pain we experience purifies our souls and is, therefore, good. Pio's visions became intermixed with visions of demons and the Adversary masquerading as angels of light. He was tormented by the confusing aspects of these visions but also, he felt, by the physical attacks of the demons. For Pio, the key to understanding the terrors was in seeing what fruit they bared in his heart and mind. When he felt despair and darkness, he knew that this was not the work of the God of hope and light. Further, Pio experienced the stigmata and became notable to many because of this gift and pain. As he bled from wounds that matched the wounds of Jesus, he found comfort in knowing that he was being purified through his suffering. These marks--and others--remained as a continual calling to Pio to continue onward in his imitation of the slaughtered Lord he loved and followed. Many called him a liar or an impostor. He denied their accusations but had little interest in arguing with them. Investigations found no fraud in what he was doing and affirmed the mysterious and mystical nature of what was going on. 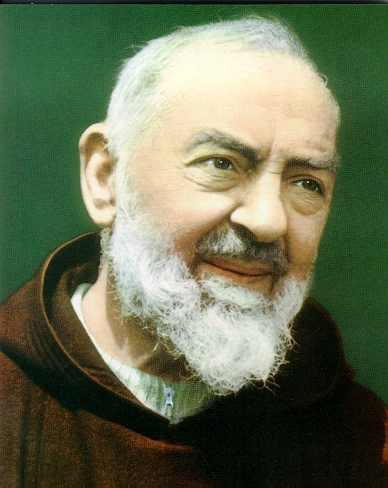 Pio died in 1968 surrounded by his brothers and sisters in Christ. He had offered a mass before retiring to his bed for the last time. A brother came and received his last confession and Pio renewed his own vows as a monk and priest. Death came quietly for Pio who slipped away muttering the name of Jesus and Mary. His funeral was highly attended and people were surprised to see the stigmatic wounds present at his death to have healed completely and left only two red marks--one on each palm. In his death, Pio rested with the God he had so long pursued with abandon. Pio passed through suffering to find himself purified, redeemed, and in communion with the one who had called him so many years prior.